East Molesey, Surrey, KT8 9AU. 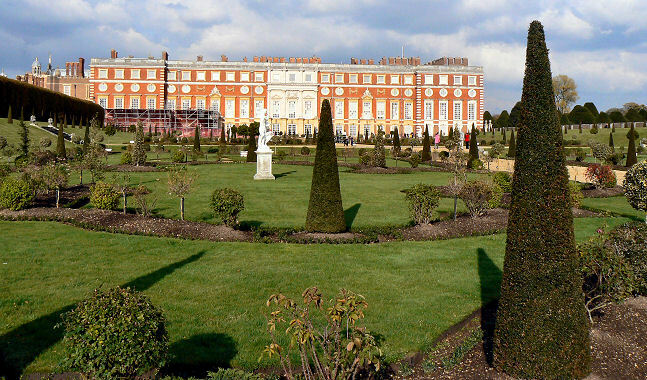 The gardens and estate at Hampton Court Palace, like the palace itself cover several periods of history and are fascinating for the garden enthusiast. Some of the trees are hundreds of years old and will have been there when famous Kings and Queens wandered past. Some of the gardens have been replanted to exact historical records and give the viewer a sense of what they would have been like at a particular period in history. The parkland at Hampton Court covers 750 acres and there are 60 acres of formal gardens to view which are all laid out in a loop of the River Thames. You may wan to see the Great Vine which was allegedly planted by Lancelot “Capability” Brown when he was Royal Gardener in 1768. It is said to be one of the oldest grapevines in the world, but if you are like me and have come to see the topiary head straight for the Privy Garden which is a splendid recreation of King William the Third’s garden complete with all the original types of planting and marble sculptures. Depending when you read this will depend on how mature the topiary shapes have become but there is already and overall wow factor due to the layout of the whole area with gravel paths. 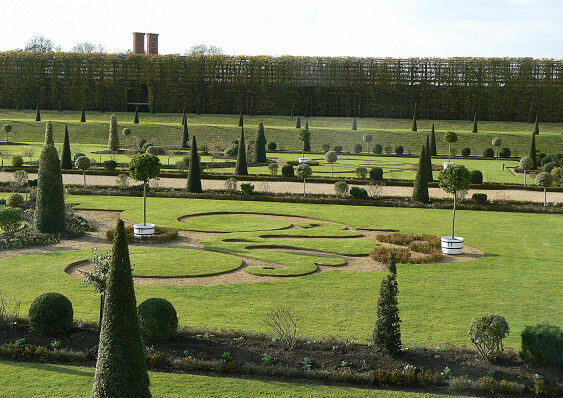 The parterres of King William the Third lasted into the middle of the Eighteenth Century when the topiary were left to grow out and the statues were removed due to the changing fashion. By the mid nineteenth Century the area had become almost overgrown with tall trees. 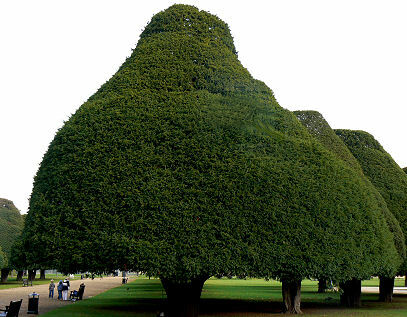 Of interest also are the ancient yew trees in the parkland which date back hundreds of years and will have been seen by famous residents and visitors such as Henry the Eighth himself. These are still clipped but because of their great age they have grown to immense girth and each have a character of their own. THey make a particularly great sight from inside the palace. forbidden from touching the maze by the king. Fashion was not allowed to get in the way of enjoyment. 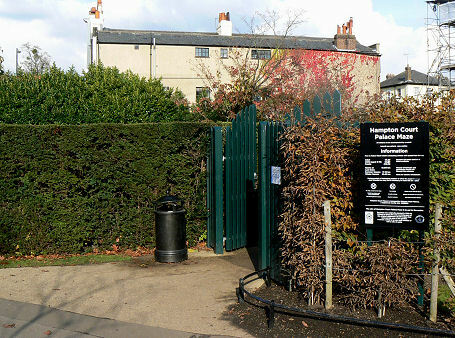 Nowadays it covers one third of an acre and has half a mile of paths between its seven foot high yew walls. Don’t go in if you are short of time as the journey to the centre takes at least 20 minutes if you don’t lose your way and then of course you’ve go to get out. Unlike some mazes I have seen there is no peeping over the tops of the hedges to guess your way. mall for you? Topiary Today covers the rest of the world including some of those fantastic Italian gardens.